Still struggling to get rid of the ‘HTTPS Not Secure’ warning? 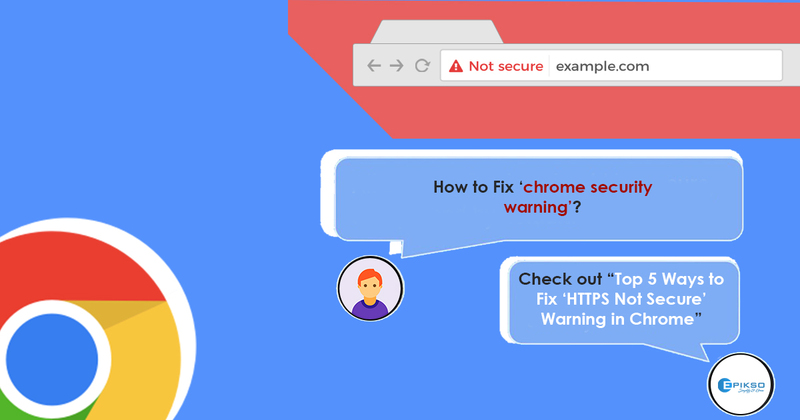 Let’s start with the very basics of these chrome browser errors and then we’ll dive deep to understand how it affects your web traffic. What exactly is ‘HTTPS not secure’ error? HTTPs (Hypertext Transfer Protocol secure) or HTTP Strict Transport Security (HSTS) is a protocol designed to transfer information securely between computers over the World Wide Web (WWW). Sensitive information such as passwords, login credentials, emails etc. are displayed as ‘plain text’ over the HTTP connection and can be easily hacked. This is why the Google Chrome browser tends to protect every piece of information that flows over the channel. This is why one should never enter their personal details on a website which shows ‘HTTPS not secure’ sign. How would you know whether your website is ‘HTTPS’ secured or not? The website opens up but there is a red strike on the HTTPS in the browser URL. The website is not opening on selected systems even when they have the same version of web browser. Is ‘HTTPS not secure’ really going to affect you? Users today show their loyalty towards those brands who reflect trust, security and ethical privacy policies. Lack of security practices on any website will not only steer visitors away but also directly impact brand loyalty amongst your repeat visitors. Needless to say, this will have a direct impact on your user stickiness eventually leading to reduced traffic, leads, website ranking and conversions from your site. Google recently rolled out updated algorithms across the internet in favor of https websites. Let’s say your website is the same as your rival’s website in terms of content, speed, and title tags etc. then the one with https security will rank higher. So, unless you want to drop down on your site’s ranking, the https issue must be resolved. Better rankings lead to better traffic and vice-versa. The https error creates a trust issue for your visitor leading them to think that they are unsecured and their information is not private. However, fixing the error would raise a signal of trust and authority which will eventually improve your site’s click-through rate. Why would somebody transact on your website if they are not sure about their online safety? Remember users trust secure connections more. A Global Sign survey says that 84% of users would disregard a purchase if they see an insecure connection. Not updating your website and not keeping up with the changes with the Google algorithm can bring you back to square one! How to fix ‘HTTPS not Secure’ Warning? 1. Checking whether HTTP Strict Transport Security (HSTS) is enabled. To enable HSTS for your site, it is mandatory for your site to have a valid SSL certificate activated and installed. Enabling HSTS forcibly will restrict your visitors to browse your site. When HSTS is enabled, a web browser automatically changes any HTTP (insecure) requests to https (secure). 2. Whether SSL certificate is enabled or not? To provide the level of security your visitors’ desire, SSL certificate must be enabled. It can be obtained from a third party certificate authority (CA). These certificates will typically be tied to the web server and to the website. You can also create your own certificate with internet information services (IIS) server, but in this case, your visitors should completely trust you. It should be kept in mind you can always update your URLs to use https links. In this case, the best thing would be to use a server-side approach to redirect the user if it’s not HTTPS. This can be done by inserting a PHP code snippet on the top of your snippet page. 4. Check if SSL certificate is available for your site, if yes then why should you install it. Now relax! These points will be able to fix all your worries! There are also a variety of other factors that you might need to consider when it comes to securing your site completely. Still, find it difficult to make your website secure? Let our experts take care of it. For an exact analogy and in-depth audit, feel free to contact us at contact@epikso.com or Book an appointment to get in touch with our subject matter experts.